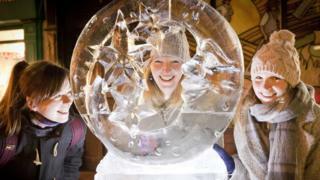 The UK's biggest ice trail has been held in York as part of the city's Christmas Festival. Forty-five ice sculptures, using more than 10 tonnes of ice, included a 2m-high Viking, and the Night King from Game of Thrones. The freezing temperatures over the weekend in York meant the sculptures did not melt. The designs, sponsored by local businesses, featured Stephenson's Rocket, a Minion and Peter Rabbit. A Lego Batman was on display on Walmgate, Garfield on Low Petergate, the Virgin Mary at Minster Piazza, and a replica of the Tornado steam engine on Spurriergate. 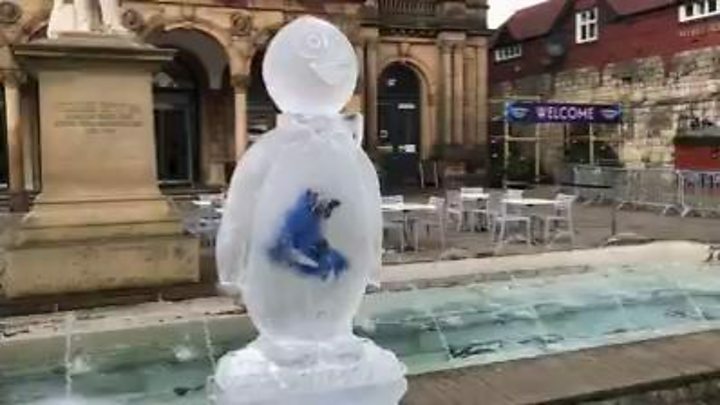 Tourist body Visit York said the ice trail would be removed before the sculptures melt, but it plans to hold a new one each year. Mat Foster, of Glacial Art, which creates the sculptures using chainsaws and chisels, said it was "without doubt" the biggest project the company had ever undertaken.